Offer irresistible chocolate flavor in your coffee beverages with this Big Train mocha blended ice coffee mix! With a name symbolizing strength and constant motion, Big Train has expanded into a global foodservice brand you can trust with a large number of diverse products to choose from. Big Train has become a leader in the specialty beverage mix industry, delivering easy-to-make and consistently-delicious products. This mix has a great flavor and is the perfect base for any mocha frappe. Best prices that I have found online so far for this mix. Love the Big Train Mocha. We use for Mocha slush or add milk and it becomes Mocha Frappe! Customers love our Mocha based drinks in the summer heat! This site have the best price I found anywhere! The Big Train Mocha Blend is great tasting. It blends well when making ice coffees and everyone has been happy with the change. Looking forward to trying the other flavors. We mix this with milk and a full cup of ice to make a great blended frappe. You don't need to add coffee to it, but can if you want a stronger coffee flavor. We use Big Train powders for all our drinks that require it. Love how it blends and our customers just love the taste. Awesome product! Excellent product. The taste is just amazing. My customers rave about how delicious my ice blended are. If you are not using this, you are missing out!!! I love this product! The flavor is not overpowering at all. I suggest this product to everyone that loves a good blended coffee! Simply awesome! Use this for a party along with the other flavors, big hit and very cheap, easy to make and with the price.. you can't go wrong. will purchase again! Big Train Mocha is the best around. This powder has a great consistency when making a hot mocha. Melts easily and blends even better. Great product with amazing flavor. Our top seller for sure. Wow! I honestly can not believe how good this coffee mix is. It has been a huge hit over the summer and I can see why. I prefer the chocolate flavor but I still use this one. I think its because of the amount of espresso added. The product is a very good quality. The mocha flavor has a nice strong taste of coffee and a little kick of chocolate that everyone loves. We have this on our permanent menu. This is a favorite at our store. We give it an extra boost by using frozen coffee cubes instead of plain ice. Topping it with fresh whipped cream makes it a dessert. This stuff tastes amazing, the directions on the bag were perfect and it comes with a lot!. Our customers love the product and it's a hit. I will be buying more in the future. Perfect flavoring for about any type of coffee you would like, has a very great taste to it and makes customers come back for more. highly recommended. The Big Train mocha blended ice coffee is awesome and sweet. A great drink mix and a perfect addition to our bakery. A crowd and staff favorite beverage. This has to be the best selling flavour at our shop by far! The taste is great and the price is better than I have found on any other websites. BIg train hit the mark when producing these mixes, we have tried several of the different flavors and they are all AMAZING! Use for smoothies, frappes, ice coffee, blended drinks, great for every application. This mocha mix is great to make a favorite hot drink blended in the summer, this way you can enjoy your favorite mocha all year round. The Big Train Mocha blended ice coffee mix is chocolatey and delicious. A great way to enjoy a frozen coffee is seconds. Blends up well and a great quality mix. A nice addition to our café. Big train mocha blended ice coffee mix has a very flavourful taste I would definitely recommend either ice or frappe its taste is great !! I love this mocha mix. I like how you can blend it just as is and make it smooth and creamy without a lot of caffine or bump it up and add some coffee. That way I can make it for my guest as a dinner/dessert treat without keeping them up at night and I find sometimes I just crave one of these in the evening. I am new found fan of Big Train mixes because they are flavorful and a great value. They always arrive packaged perfectly. 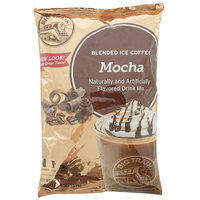 The mocha blended ice coffee mix is great for making the classic chocolatey coffee frappes. The taste is exceptional and blends really well. This one is definitely a customer favorite. It has a nice chocolate taste without it being too overwhelming. It also blends well with caramel. I personally can drink this without getting a headache like I do when I drink other mocha frappes. So far we only used this drink as a coffee sweetener, and it’s a much better alternative for those of us who are trying to limit calories whilst indulging in a rich coffee drink! The aroma, flavor and ease of mixing are all 5 star ratings at our shop! Webrestaurant has the BEST prices! Big Train frappe products are awesome... Super easy to use, Taste fantastic and come is lots of great flavors! Happy Webstaurant has a good variety of flavors. Excellent to make frappes, our costumer love it, we love it too, is it a really a good item to have in our menu, we strongly recommend. The best mocha option out there, milkshake like consistency. Delicious flavor, and mixes well with other flavors and syrups or sauces!! Highly recommend! It's also good with a couple extra shots of espresso. Our kids could not wait to open the Mocha mix this morning. It has an authentic taste that is not overpowering but is true to taste. Big Train makes an awesome mix product and we cant wait to try others, as they absolutely loved this one! The big train mocha frappe is one of my top selling frappes. It taste great with a shot of espresso in it too! Very good! This is like my third time buying Big Train products, the product never fails to please my family, friends and customers. It's a little pricey but I can get about 4 gallons of base finished product from every bag. We have a Grab & Go special each week in our coffee shop and this is the number one seller. Add a little chocolate syrup and whipped and you have an amazing drink. My daughter adored this coffee flavored frozen treat! I followed the directions on the package, and it was very thick...But delicious, nonetheless. We ate this with a spoon until it melted a little...You might want to start with more liquid if you prefer a thinner frozen drink. Always a must have when doing frozen coffees! Love Big Train Products! My customers love it too so it is a must have for my business! I love this mix. It is easy to whip up, offered at a great price and and tastes very similar to those frappe beverages that you get at the drive thru. I was extremely pleased to see that you have Big Train. I absolutely love this brand and its the best price that I have found. Getting my next order ready and cant wait to receive it.